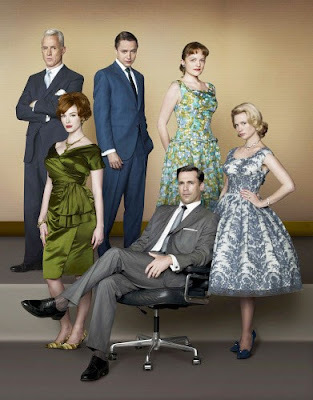 A Mad Men marathon is going on around here. I didn't expect the show to be so gloomy about relationships. It is one of those shows that overdoes the negative drama to try and "teach" everyone a lesson that they should (a) really not do what the characters are doing, (b) start today by righting your wrongs, and (c) don't have it as bad as the people on TV. Geesh, lesson learned. I wouldn't say I am hooked after watching the whole first season, but I am willing to waste a few more hours seeing if Season 2 peaks my interest a bit more. It is fun to see my exact desk on TV! I don't think a golf course in Berkeley is as cool as a top advertising agency though.